We invite you to enjoy the completely REMODELED Unit #622 with its incredible SUNSET BEACHFRONT setting. This lovely home can accommodate your family with a luxury king-sized memory bed master and double pull-out memory bed sofa. 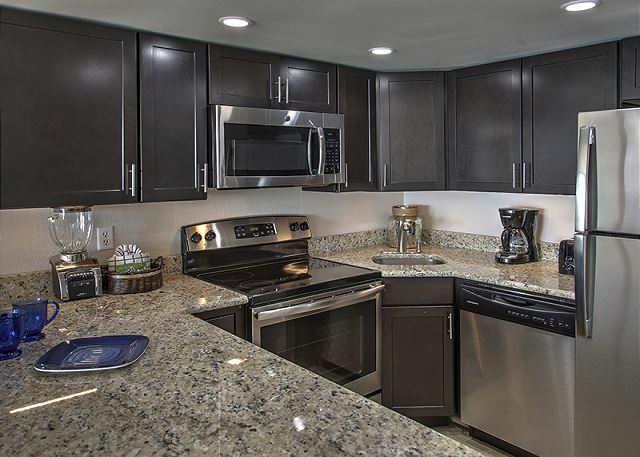 Beautiful kitchen includes new granite and stainless steel appliances, tile floor throughout, comfy living room with 42' Flat-screen TV, with FREE "Now DVDs", WIFI, FREE beach service during peak season, and much more! All this while you relax on your balcony watching the waves, dolphins swim by or just soak up the sun! Enjoy complimentary Xplorie excursions to enhance your vacation. Glad you enjoyed your stay. It's great when paradise is conveniently located in the real world. Please come back soon. This was a great place to stay and 622 was more than excellent. The view is incredible, you can see the ocean and the beach from your living room sofa. The condo was very nice very clean and had everything we needed. The location was close to everything and we saw dolphins all day long. The inlet to the harbor is near so we could see all of the boats coming and going. We will be back and will want this condo again. Glad to hear that even the Dolphins cooperated to give you the dreamy Destin experience. Try us in October the weather is great and the sunsets are spectacular. This was our 7th time visiting Destin and our 7th time staying at Holiday Surf and Racquet Club and our 3rd time staying in Unit 622. 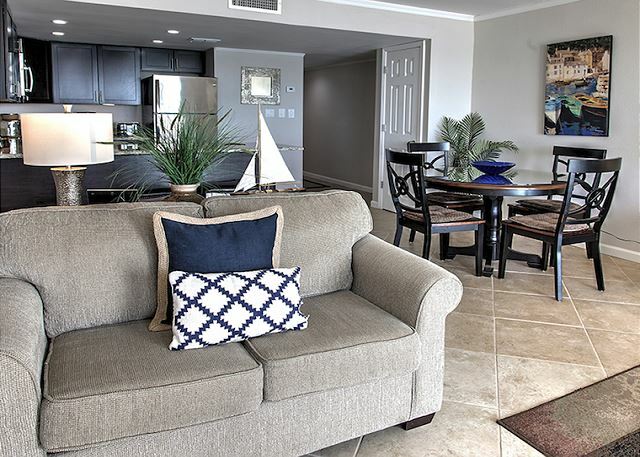 We love Unit 622 for so many reasons, the amazing view of the Gulf of Mexico, the up to date and comfortable furnishings of the apartment, the super comfy king size bed and the list goes on and on. Holiday Surf and Racquet Club is always a relaxing get away for us. We love the location, we love walking down the beach to the jetties to watch the dolphins (or you can watch the dolphins from the balcony of your unit too! ), the property is top notch in every way, the staff is very kind and helpful which always makes for a great stay. 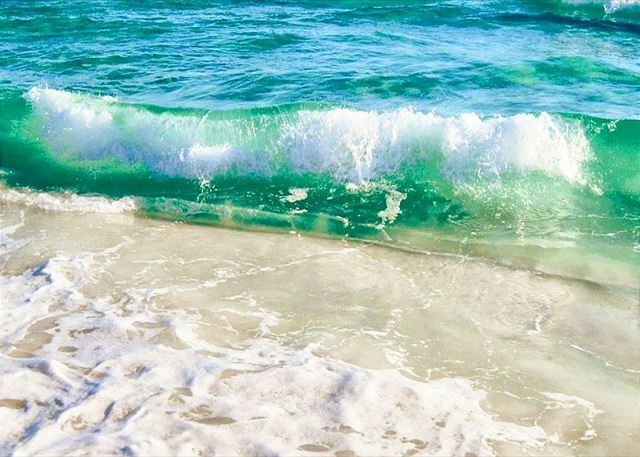 We love escaping a little bit of our Illinois winters in beautiful Destin, Florida! This was our second stay at this facility and our first in Unit 622. The staff was friendly and eager to help. The unit was beautifully decorated, clean, and well equipped. The bed was comfortable, and there was plenty of storage space. Highly recommend! Also, try Cappricio Cafe while you are there. We made 5 visits in 7 days for breakfast, lunch, or coffee. Fantastic! 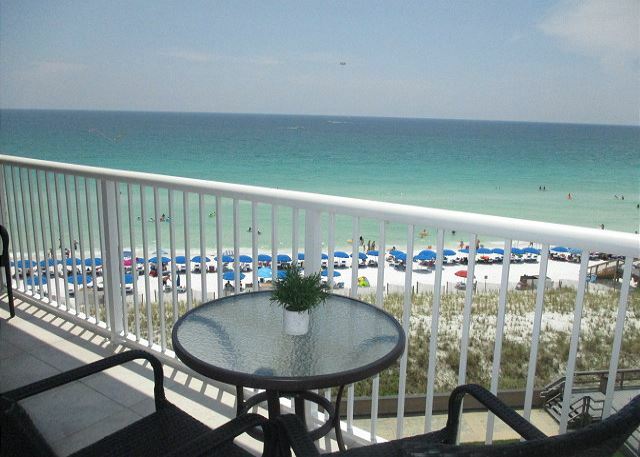 This was our first time to Destin AND our first condo rental. We usually stay in hotels or resorts but I can definitely see us staying here again in the future. First of all, I love the location. It's on a quiet, private beach but only a few minutes from restaurants and harbor. It's a beautiful property with oceanfront view. I really love having a kitchen for breakfast/lunch instead of going out for every meal (which gives you more beach time). I also love the complimentary umbrella and chairs they set up for you on the beach! The only con that I can think of (and this is very minor) is you get two free movie rentals per night (which we decided to take advantage of on a stormy night) but we were unable to watch a movie because the DVD/TV is somewhat old school with three remotes that did nothing. That is my only complaint but to be honest, we don't go on vacation to watch TV so it was not that big of a deal (but some renters might want to know). Loved this place and hope to be back next year! Thank you for your review and feedback on your recent stay at Holiday Surf and Racquet Club. We apologies that you DVD player was not functioning properly. We would have readily remedied that issue, should it have been brought to our attention. We value your comments and concerns and that is the reason for the form in your packet to return to us. Unfortunately we can not catch every issue and truly respect your comments to make your stay the very best! I was very pleased with our vacation rental at 622 Holiday Surf & Racquet Club. We stayed from 9/15/18 - 9/22/18. The property description is accurate. Location, layout and amenities were as described. Our condo was clean and well-maintained. We got excellent customer service from the front desk and maintenance staff. I will recommend this condo to friends and will stay there again. I loved the updated decor. The condo was well-appointed. The bed was very comfortable. A beach umbrella and two chairs were included everyday. My husband and I exercised on the treadmills and weight machines in the on-site gym every day. We were able to swap towels two times during the week at no additional charge. 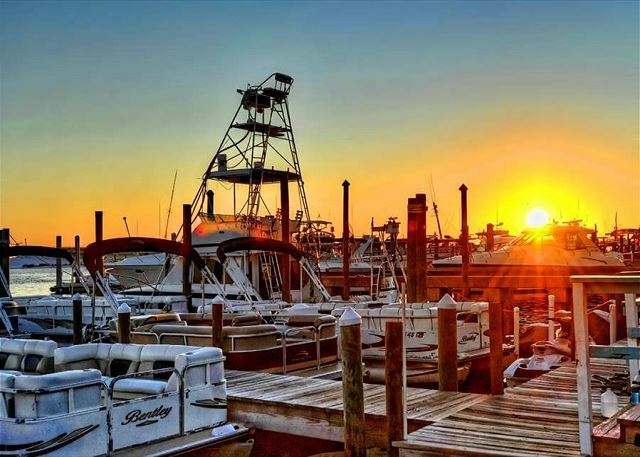 We were located very close to Destin Pass and got to watch the fishing boats go in and out of the harbor every day. A manatee was videoed two buildings down from us and dolphins swam back and forth all day each day. The view is southwest. We saw 7 beautiful sunsets and got up in time for three beautiful sunrises from the walkway by our entry door. The condo is conveniently located on Holiday Isle and is near Target, Hobby Lobby, Winn Dixie and numerous restaurants. The best decision we made in our vacation to Destin,FL. Was choosing holiday surf and racquet. Room 622 was perfect! We had no complaints during our stay. The location was wonderful. Great view right on the ocean and could watch dolphins from our balcony. The girls at the front desk were very informative and helpful. We loved having the private beach right at the condo and umbrella service. Very family friendly area. We will be staying againa in the near future. Everything was great. Very nice complex with good amenities. Would say again for sure. This property's description is accurately described and every bit as clean as the photos illustrate...A BEAUTIFULLY DECORATED AND WELL-MAINTAINED UNIT! Thanks for such thoughtful, secure and hospitable accommodations. We highly recommend #622 and hope to visit again in the near future. THIS WAS A PERFECT ANNIVERSARY GIFT TO MY HUSBAND OF 18 YEARS! Fabulous! This rental property was awesome, the location couldn't be better, this particular unit had the very best views of the beach/ocean - from the deck and from inside the condo. Unit was very clean. Bed was comfortable, didn't really use any other furniture (I was there solo). Never could figure out the icemaker, but got along without it. PM staff very friendly and helpful. Location in Destin awesome, so close to many shops, restaurants, etc. Would highly recommend -will definitely come back! I was there for a wedding, need to go back just for some vacation time. This is our sixth trip to Destin, Florida and our sixth stay at Holiday Surf & Racquet Club so I think that speaks volumes about how much we love Holiday Surf & Racquet Club. This was our second stay in Unit 622 and it is a very nice unit. The furnishings are all up to day and very comfortable. The only thing that would be nice is if the old glass shower door was removed from the tub/shower since they now have a shower curtain in place, we are tall so we have to be careful not to hit our head on the frame of the door when getting in and out of the tub. The king size bed is super comfortable as is the furniture in the living room. The kitchen is nicely stocked. All of the staff at Holiday Surf and Racquet Club are so friendly and helpful, the reservation desk staff and the housekeeping staff are all top notch. The linen exchange is a nice amenity for sure. It was nice to see the additional updates that have been made to the grounds and facility. As always the beach was so beautiful and relaxing. We love watching the dolphins swimming by from our balcony and we always make a daily walk down to the Jetties to watch the dolphins, fish and birds from there. Can't wait to see you again some day! This was a great unit, with gorgeous views. The property was very clean and the bed was so comfortable! It would have been nice if there were a few coffee filters in the unit, but we bought and left some for future renters. We would highly recommend this vacation rental! We had a fantastic trip! We were happy with our condo. The friends we travleled with did not have the same positive experience on their specific unit! 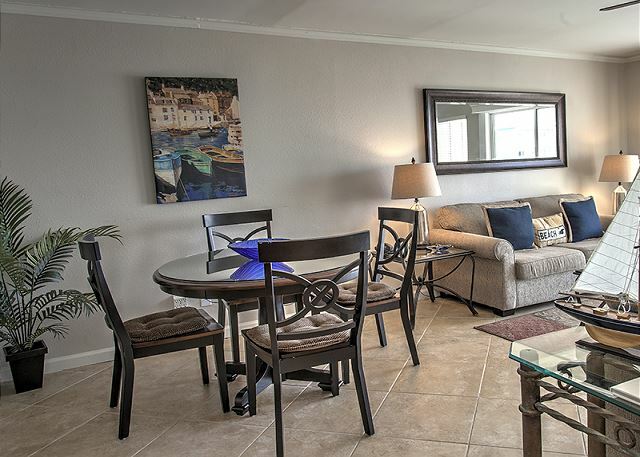 If you're visiting Destin, holiday surf and racquet club unit 622 is the way to go! It's remodeled, great comfortable extra touches the owners have put into this u it, and the view is amazing. This year was our fourth time at unit 622. The rest of the main facility/lobby have had a recent update too and look really nice! 2nd year at Holiday Surf & Racquet Club, 1st stay in 622- can't think of a reason we wouldn't choose this unit again!! Saw dolphins from the patio every morning, and had a great view of Thursday night fireworks! HSRC is a dated building, but this unit is fabulously updated, memory foam bed is comfy, decor is lovely. AC unit is loud, but we noticed that last year in another unit, its just a thing you get used too. The fridge had defrosted and was not cooling our first night at 622 but the staff promptly provided us with access to a different fridge and the one in our unit was repaired by the next day, great service. Great condo! Very clean and updated. Beautiful view and just steps away from the beach. 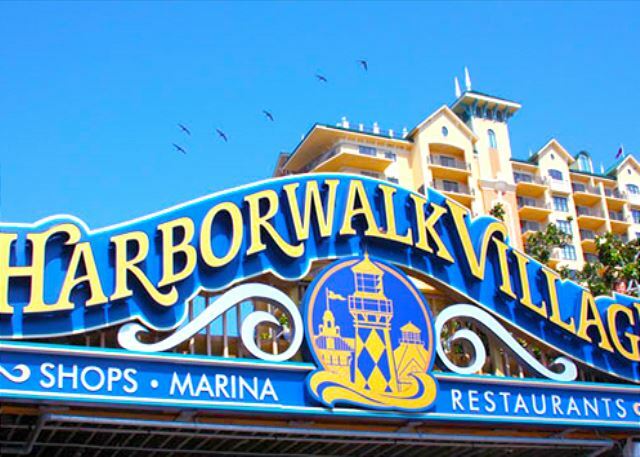 Easy access to all of Destin's restaurants and hot spots. Would highly recommend this property and will definitely stay there on our next trip to Destin. We had stayed in this condo two years ago after its renovation and think the décor is lovely. At that time it was fully "stocked". The kitchen needs a small frying pan - cookie sheet - muffin tin - and more spoons. The dishwasher needs "adjusting." Too, the mattress is far too soft and lumpy. I am aware that "guests" do not always value property! But we love the condo and view. Just could not improve the weather while there! This property was in an excellent location, convenient to restaurants, shopping and just steps to the beach. Unit was very clean and decorated beautifully. The only complaint we had was the sofa was uncomfortable (had to watch T.V. in the living room) and the air-conditioning was loud. We had a wonderful stay and I would recommend this place to anyone of my friends! The condo was very nice. Lots of updates and great view of the ocean. Free DVD rentals with recent movies was awesome! Free beach chairs and umbrella daily. No real game room to speak of. The resort is simple with laundry on 2 floors but overall a nice stay. I would stay here again. We loved that holiday surf was away from the noise of Destin. The staff was great and the service was top notice. The free chairs saved us a lot of hassle getting to and from the beach as well! We will definitely be coming back. This condo is perfect and the location is wonderful. Thank you! We are thrilled that you enjoyed your stay in unit 622! Nice 4 day stay. Property was well keep and they were updating while we were there. New coded locks on doors, new thermostats, and new ramped walkways. This unit was very nice, with newly remodel kitchen, bath, and decor. Bed slept comfortably and the view was spectacular. The only things lacking were the hot water heater did not supply enough hot water for a good shower that included washing your hair and shaving your legs and having 2 elevators located at the opposite end of the building. Thank you so much for your review! We are busy updating and maintaining our property and are thrilled to hear that you enjoyed your time today. We will certainly look into the hot water heater to ensure it is working at an optimal level. We look forward to your next stay with us! GREAT AS USUAL, BEEN COMING HERE FOR 40 YEARS NEVER DISAPPOINTED. PROFESSIONAL, COURTEOUS STAFF, GOOD .PROPERTY CONDITION. Thank you for your review and continued loyalty to HSRC!